An elephant's tusks are really incisor teeth which keep growing throughout the elephant's life, although general wear and occasional breaks can keep their size in check. They are made from layers of dentine (ivory) which is very hard. Male (bull) tusks tend to be larger than female (cow) tusks although it is possible to find tuskless members of both sexes. Jonathan Kingdon's excellent "Field Guide to African Mammals" suggests that the length and versatility of the elephant's trunk enabled the elephant to evolve into a larger mammal, at the same time reducing the requirement of incisors for feeding functions. Their limbs lost functionality as they adapted towards bearing an elephant's great weight, leaving the head as the main focus for dealing with the environment. The trunk is used for retrieving food (drinking water, ripping vegetation, picking berries or rummaging the soil and undergrowth) and some gentler activities such as cleaning themselves. The tusks are used as weapons and general purpose tools. Besides their tusks, elephants have single molars (a series of six which wear away in succession throughout their lifetime) for grinding the rough vegetation they eat. Both African and Asian elephants are under threat from poachers who kill them for their ivory tusks. Although early poachers would only kill one or two elephants at a time this would still have had a big impact on the population, mainly because the poachers would kill the older male elephants for their larger tusks. Killing older elephants means that immature elephants are left to grow up without any parents to help them (young orphans may even die). Killing mostly male elephants means that there is a dangerous imbalance between the ratio of male to female elephants. Things are much worse now as modern poachers are more organised and have better weapons so that they can - and do - kill whole families at a time. Fortunately today's world is more aware of the impact of ivory poaching and smuggling. An international five-year moratorium on ivory trading was agreed in 1989, the year when President Moi publically burned a large pile of ivory in Nairobi National Park under the direction of Kenya Wildlife Service's Dr Richard Leakey. More recent methods to track elephants and fight poaching involve 'fingerprinting' their footprints and ear patterns. There is a debate whether ivory trading should be allowed in a controlled way or banned completely. One argument in favour of a controlled trade is lowering the black-market value of ivory. One argument against any trade is whether we should be making money from a scheme which could encourage more poaching. The elephant is the world's largest land animal. The elephant can use its nose (trunk) as an extra limb for eating, lifting things and squirting itself with water. An elephant's trunk is double-pointed, helping it do delicate jobs like picking berries. An elephant uses its ears to keep cool; each ear carries many fine blood vessels close to the surface which help disperse heat, especially when they are flapped. An elephant also uses its ears to express emotion, for example anger. 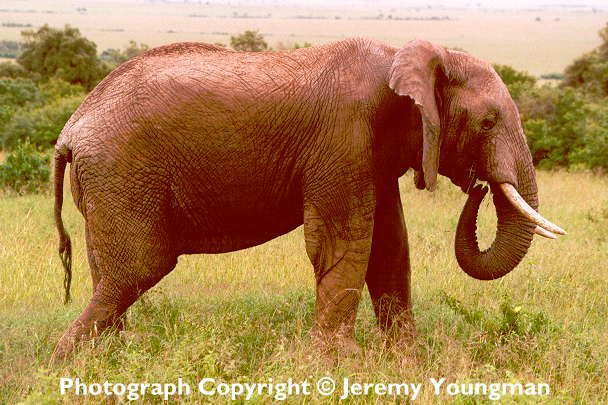 African elephants have larger ears than Asian elephants. The patterns on an elephant's ear are unique - just like our fingerprints. Elephant feet have soft cushioned soles which help them move around quietly. Click here for a photograph of an elephant. Size Height Adult shoulder height up to 4 metres (male) or 3.5 metres (female). Newly born infant height up to 1 metre. Ears up to 2 metres high by 1 metre wide (old male). Weight Adult weight up to 6,000 Kg (male) or 4,000 Kg (female). Newly born infant weight 100-120 Kg. Single tusk weight 25-45 Kg (record is over 100 Kg). Life cycle Gestation 22 months. Births Any time of the year, typically every 3-5 years. Maturity Sexually mature at 15-20 years (male) or 10-15 years (female). Lifetime Up to 65 years. Notes Diet Herbivorous (from grasses to shrubs and trees). Adult elephants are notoriously destructive as they require lots of food every day (200-300 Kg of food and 100-200 litres of water). Habitat Savannah and woodland / forest. Activity Active day and night but may seek shelter during hottest periods of the day. Family Live in groups of 10-20 animals, usually led by an old female (called a matriarch). Sometimes several groups will join together briefly forming larger herds. Very protective of young calves; an elephant giving birth will often be guarded by other females. Old males tend to be solitary. Predators Humans! (through poaching and conflict for territory and food).